For this month’s challenge of the Royal Foodie Joust, I made Veal in Dark Beer with a Sweet and Sour Pumpkin Sauce. Every month there is an event going on, where the winner chooses three ingredients with which we have to cook. Although I love participating at this event as we challenge ourselves to create recipes we would never dream of making, most of the times the ingredients given are not so easy to find in Greece. When I saw the ingredients this month, which were Black beer, sugar and pumpkin, I was really happy and knew I could make a recipe with the three ingredients chosen by the last winner of the Royal Joust. If you think sweet-and-sour food belongs only to Chinese cuisine, you’re only partially correct as Ancient Greek Cuisine also had sweet and sour tastes as well. Although it is rather impossible to recreate ancient dishes, as we do not know the exact spices and ingredients they used nor do we cook using the same utensils and methods, garos was a sauce made from fermented fish, similar to soy sauce and fruit, petimezi (grape molasses), honey, vinegar were included in their dishes. Although I have never cooked with pumpkin before (except of course for making pies, I knew that the natural sweetness of the pumpkin, plus that of brown sugar and fruit, would perfectly match with the toasted/roasted malt aroma with a hint of caramel and some minimal fruitiness and a little bitterness of the bock beer, so my choice was to make sweet and sour, inspired by ancient Greek cuisine. You can cook this dish in a Dutch oven without having to use a skillet. My casserole dish cannot be used on the stove top, so I prepared the first step in a skillet. Although originally I was thinking to leave the dish as it was, when it was cooked, I was really skeptical if my teenage daughter would eat it at the sight of cooked pumpkin and onions, so I had to think of something that would appeal to her. She loves pasta and she doesn’t mind eating carrots, so that is the reason why I decided to puree it, in case she would ask “what’s in the sauce mum?” I would tell her carrots. The meat was tender and flavourful and the sauce was delicious. My daughter ate it without any complaints and the rest of us kept adding more and more sauce, mixing it with the pasta. This is definitely a dish I will make again. Wash and strain the meat. Season well with salt and pepper and make two slits in the meat adding 1 clove garlic and the cinnamon stick. In a large skillet heat the olive oil and brown the meat on all sides. Add the carrots and pumpkin around the meat and sauté for a few minutes and transfer browned beef and vegetables to an ovenproof baking casserole with lid. Add the onions to the skillet with ½ teaspoon of salt and cook until onions are lightly browned. Add the remaining 1 clove garlic, finely chopped and cook for a few more minutes. Add the flour and stir until onions are evenly coated and flour is lightly browned, about 2 minutes. Stir in beer, soy sauce, thyme, bay leaves and salt and pepper to taste, scraping pan bottom to loosen browned bits. Add the fruit juice and increase heat to medium-high and bring to a full simmer. Pour the sauce over the meat and vegetables and discard the bay leaves. Cover with the lid and place in a preheated oven to 200°C / 400oF and cook for 1 hour. Turn over the meat and continue baking until tender for about 1 more hour. Half way through cooking, mix petimezi and mustard seeds with balsamic vinegar and pour over meat, mixing well. When cooked, remove the cinnamon from the meat and set aside to cool before cutting the meat into thin slices. Discard the bay leaves and strain the vegetables, reserving the broth. Put the vegetables with 1 cup of broth in a food processor and purée. Put them in a small pot and simmer until the sauce is reduced to a thick consistency. Serve with pasta, rice, potatoes etc. Note: Leftover broth can be stored in the refrigerator for 3 – 4 days and can be used in other recipes. This is a great entry Ivy! I am so happy you were able to join us this time! OMG this sounds amazing, I am definitely making this recipe. That meat must be tender and tasty! And that sauce sounds delightful! Good luck Ivy! This dish sounds great … I love beef cooked with beer and the sauce seems to complement it very well. What a beautiful and creative dish! I was amazed at how delicately colored your “beef” was…so I had to some see…it’s veal!! I can’t get veal in California! It’s so hard to find! Good luck in the joust! I hope you’ve had fun this far! I would love to have a go at that sauce, looks so good. Wow, I never would have thought of that combination, but it sounds good! Glad your daughter liked it too. All I can say is WOW Ivy ;;; this is truly a dish that took alot of creativity to come up … it’s lovely all the contrasting flavours … Veal and pumpkin seems ovely together! I am not sure what bock beer is but dark beer I am sure with pumpkin is so very warming for Fall! This looks and sounds just lovely! Good luck on the joust! ivy,it’s awesome this dish!a wonderful week-end! Looks wonderful! The meat must be very flavorful and the sweet & sour pumpkin sauce sounds fantastic! great Joust entry! Another great way to enjoy some pumpkin! Ivy, I wanted to let you know that my hubby has already requested we make this recipe in the near future. Beef and Beer? Loves the idea. Great recipe my friend. Thanks to two new friends for passing by: Glennis and Tastes of Beirut. Teresa, hope you and your hubby enjoy the recipe. Ivy, this looks delightful! Veal braised in beer is going to be a hit with me and the aromatics you chose would be so seductive. Mmmmm…..
You always show so much culinary creativity! Yum! This is my kind of dinner. 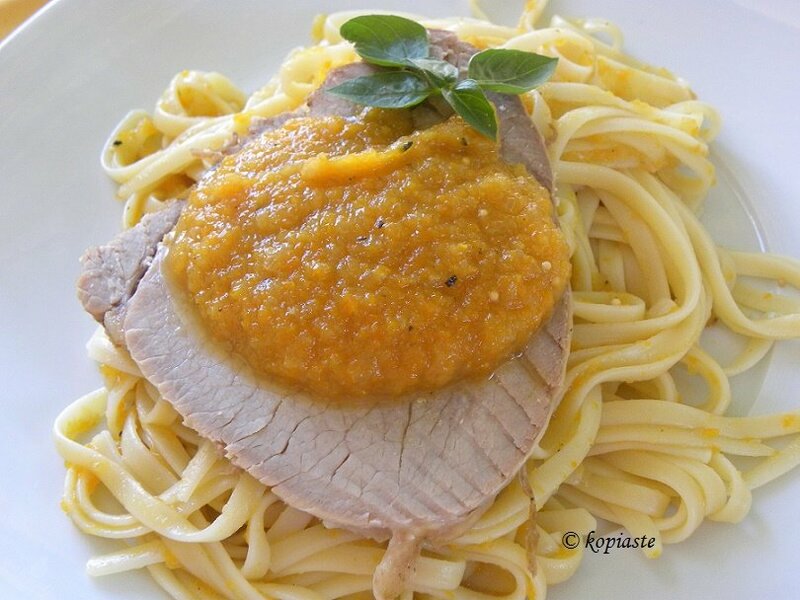 I love this beautiful delicious pumpkin sauce a lot! This is something i really love to have on my dinning table, the pic was really fabulous, thanks for sharing the recipe.